Blocking highways is one of the preferred forms of protest by members of the Black Lives Matter movement. It’s also incredible dangerous and stupid. It certainly doesn’t endear anyone to their cause, it just makes people angry. Some of them did this on a highway in Virginia over the summer and were arrested. Now they’ve been sentenced to jail time. It’s not long but it’s something. Activists associated with the Black Lives Matter movement will see the inside of a jail cell after blocking a highway during a protest in July. The Richmond, Va. protest, which falls into a long line of recent race-related protests and riots, occurred on July 18, and was likely set off by the police shootings of Alton Sterling and Philando Castile that month. 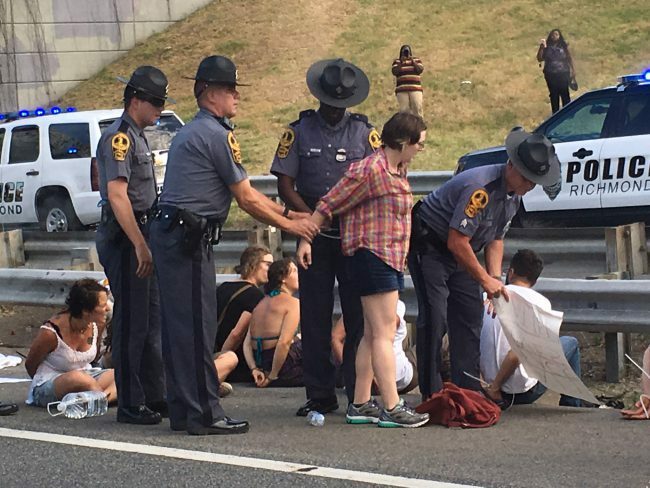 Thirteen protesters blocked Interstate 95 and chanted “Black Lives Matter!” and “No justice, no peace, no racist police!” They shut down traffic during rush hour, but not for long, as police showed up and made arrests within an hour. They all pleaded guilty to illegally blocking traffic Monday and were sentenced to five days in prison. Perhaps if the penalty for this was more than five days in jail, people would do it less.